Lots of Loki love today! Is it May yet? Here's Tom NOT answering my tweet. And check out that awesome Thor poster! Today The Avengers official Twitter page hosted a live Twitter Q&A with some of the stars and Joss Whedon. Even though Buffy is one of my favorite all-time television shows, it wasn’t enough to sway me. Until I saw that Tom Hiddleston was also joining in (I didn’t even know he was on Twitter!) I had to get in on the action. Of course neither Tom nor Joss answered my tweets (oh well) but it plunged me straight back into my Loki obsession while I was at work. I won’t go into my strange attraction to misunderstood evil masterminds (hello, Benjamin Linus), at least not in this post. But the combination of Loki possessing this trait and Tom Hiddleston’s penchant for long character-essay discussions during panels make an irresistible draw for me. I am just so psyched that Loki is the villain in The Avengers and I am way more interested in him than most of the others combined (well, I am anxious for more Jeremy Renner). Seriously, if you watch any panel where Tom is involved, the majority of questions go to him and he just…knows exactly what to say; he is definitely as emotionally invested in Loki as I am. And his answer-tweets were a treasure trove of Loki insights and teasers. What was your biggest challenge in playing Loki in the #Avengers ? @twhiddleston: The biggest challenge was magnifying his menace without losing touch of his emotional truth. Keeping his chaos honest! In Thor, you had lots of emotions. In #Avengers, was there a day where you were devastated emotionally after “cut”? @twhiddleston: In all honesty, yes. Sometimes you wake up feeling warm and sunny, but the scene requires hatefulness and spite. You have to reach deeper. And stay aware of the fact that the emotions are true, but they’re not mine. Might we see a more mischievous (rather than mostly just evil) Loki in the #Avengers ? @twhiddleston: ENTIRELY. More mischievous. More evil. More hubristic. More delusional. More damaged. More badass. In the end of “Thor”, we see that Thor still loves his brother and misses him a lot. Does Loki feels the same? @twhiddleston: The opposite of love is not hate but indifference. And Loki hates his brother. Who are these Avengers? They were made to be ruled. He doesn’t want revenge so much as identity. Belonging. Purpose. Self-esteem. Through delusional dreams. MARGIN CALL was sensational. Smartly written, impeccably performed, utterly compelling. Chilling, brilliant, terrific. I finally worked up the motivation to watch The Help (with a little nudge nudge from Amazon since it was a weekend rental deal). Okay. OKAY. I liked it. I found myself extremely invested in many of the characters. And if I wasn’t particularly invested, I was still engaged. After last night’s SAG awards (where The Help won for best ensemble and Viola Davis won for Best Female Actor in a Dramatic Role, not to mention the continued streak of Octavia Spencer) I am hoping that the momentum will shift towards The Help in the Oscar race. Although, let’s be honest, The Artist winning for best ensemble would have been a joke. Keep in mind that I am still operating under the assumption that I will not be as charmed by The Artist as the rest of Hollywood seems to be. Months from now there may come a post about how clearly Past Me was an idiot and The Artist is the best thing ever. (But Present Me is letting Future Me worry about that). I loved, loved, loved Jessica Chastain’s character. I hadn’t heard of her until maybe the beginning of 2011 when she got cast in every single new movie but she’s great! I hate all the Bridge Club women for looking down on her and I was SO HAPPY that Mike Vogel actually loved her (as opposed to marrying her solely because he knocked her up). I had a feeling it would turn out that he knew about Minny cleaning the home and cooking the entire time, but it was still a sweet reveal. Clearly there is a deleted scene...right? Whaaat is happening? I also didn’t know about Chris Lowell playing Emma Stone’s love interest. Now my criticism here may be one part I always fall for sappy love stories and one part I didn’t read the book so maybe something got lost in adaptation, but: Stuart quickly saw that our heroine Skeeter was different from the other women and loved her for the same reasons we did. He tells her to write about something that matters and all seems well. But when she reveals how radical her writing really is, he completely flips out, without any indication he would react in this fashion. Yes, I realize that Skeeter moving to NYC probably would have put the kibosh on the relationship anyway (she is moving into the world of Don Draper…) but that is a much more valid reason then his little hissy fit. I guess the writers wanted to resolve the storyline (in case people went out of the theater seriously fuming “well it was nice but what happened to Stuart, I just have to know! !”) but this is one of my biggest film pet peeves: a throwaway scene at the end of the movie that basically unravels an entire storyline. Oh well. My hope is that the storyline is a bit clearer in the novel? The clothes! Had to jump on eBay immediately after and cruise the vintage section. The fashion, yes please! They can keep the hairstyles. I see a lot of people comparing this to Crash and citing that as a reason it may win Best Picture. I disagree, mainly because I do not feel Crash was deserving of Best Picture. It was preachy and everything that The Help was not. The Help may win for the same reasons Crash won but it is definitely in a different league. Hollywood is pretty full of itself this year: The Artist, Hugo, and My Week with Marilyn all harken back to the glory days of film. These choices are the epitome of conventional: no Shame, no Bridesmaids, no Tinker Tailor Soldier Spy. I feel wholly uninspired by this year’s best picture nominations. In years past I was excited by races like The King’s Speech (vs. The Social Network) and The Hurt Locker (vs. Avatar). I have no such drive or interest to see The Artist or Hugo. Best Picture Thoughts: This year I have seen precisely 2 of 9 nominated films—and I have no real desire to rush out and see any of the others. Why not just go ahead and have a 10th film if the voters are so divided? Hello, why not throw in Bridesmaids or Tinker Tailor Soldier Spy? Other than the two I have seen, the rest of the nominees are a pile-up of films that I had an excuse to pass on for one reason or another. The Artist: a celebration of old Hollywood that is notable for its nostalgia in this day and age but would be less of a sparkler in 1925. The Descendants: most comparisons likened it to a Lifetime movie. Extremely Loud and Incredibly Close: simply, got mixed to negative reviews. The Help: did not pique my interest. Hugo: thought it was a kid’s movie? Moneyball: sports movies are my kryptonite. The Tree of Life: history of the cosmos, what? With all the other stunning films of this year overlooked, I might make an attempt to watch those films already out, namely: The Help, Moneyball and The Tree of Life. That would put my count at 5, and I usually push for at least a majority. Right now I am placing bets on The Artist (and I generally make an exception to see what I believe will be Best Picture) but I feel so unmoved in this race. So disappointing. I have been on a streak of seeing and predicting Best Pictures since 2007. And last year was a banner year: I saw every contender except Toy Story 3; can it please be last year again? Good thing Michael Fassbender is such a dedicated actor. No really, I don’t think he needs an Oscar to validate his work. Yet. The snubbed: Too Polarizing? Young Adult, Shame, We Need to Talk About Kevin and Drive, the darker and more groundbreaking films, were all snubbed. Andy Serkis, Patton Oswalt, and Albert Brooks were all expected to be nominated. But Michael Fassbender wins for most shocking snub. I am still very dismayed over his exclusion. Peter Travers throws in Michael Shannon and Tilda Swinton as well. Best Actor: Seems like George Clooney has the momentum right now; even if Michael Fassbender failed to combat the might of Clooney, he deserved a nod for Shame. I do think Tinker Tailor deserves some love, so go Gary Oldman (in his first nom!). I resolve to check out A Better Life as soon as possible. Best Actress: So far I have only seen Girl with the Dragon Tattoo but Michelle Williams is the darling in this category. However, I have a feeling that when Albert Nobbs finally reaches my eyeballs I will be very impressed with Glenn Close. Hell, I already am…she is a fellow alum! Best Supporting Actor: Christopher Plummer all the way. I love me some Beginners. And Patton Oswalt (hooray for another alum!) wasn’t nominated. Sad face. But at least he has a good sense of humor about the situation. Best Supporting Actress: The GGs seem to indicate Octavia Spencer, but this has been quite the year for Melissa McCarthy. I don’t really know my stuff well enough to pass judgment on the other categories (how great would it be if Bridesmaids won Best Original Screenplay!? Or Midnight in Paris.) But as someone else pointed out, no Art Direction nod for Tinker Tailor? If I hadn’t watched the HBO First Look on TTSS, I wouldn’t know about how many meticulous ideas came together to create that stunning 1970s atmosphere of dread. Best Song: Apparently only two songs were up to snuff this year. The day Bret McKenzie wins an Oscar will make this girl very happy; and I haven’t even seen The Muppets. Here is a glimpse at how insane the voting rules are for the Oscars (and why only two songs made the cut): Songs are watched in the context of their films (during scenes or even the credits) and academy voters rate them on a scale of 1-10. Those with an 8.5 or higher are nominated. So apparently out of the 39 eligible songs, only these two scored higher than an 8.5. Thanks, Entertainment Weekly! I have already reached a state of denial: how can we fix this year’s Academy Awards? Seems like I am going to have to ride out this storm of disappointment. 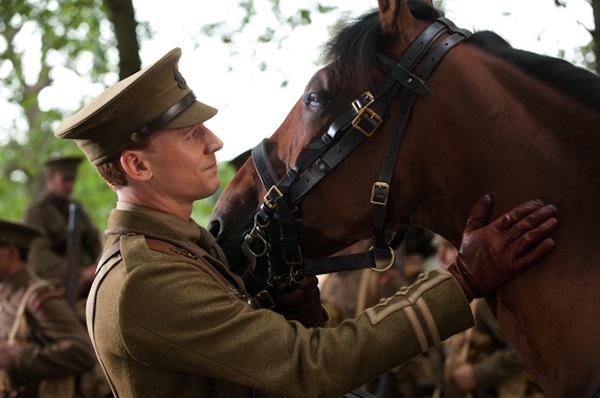 I have to admit: I went into War Horse with fairly low expectations. Yes, Spielberg is a favorite, but after age ten I haven’t been able to get invested in films that largely revolve around an animal. I expected to go in, suffer a bit through “oh, I surely love my horse so much” parts and enjoy some quality time with Tom Hiddleston and Benedict Cumberbatch. Surprisingly for me, I gleaned much more enjoyment from the film overall than I anticipated. So here is my breakdown of the film (into its piecemeal way of storytelling) and what I liked/liked less as well as the obligatory Downton Abbey comparison. (I am talking explicit plot points here, but just in case let me say in my best pirate: THERE BE SPOILERS AHEAD.) The past few months have been steadily increasing my knowledge of the Great War, especially with Downton and Boardwalk Empire. I say, keep it coming! Part One: When you covet thy neighbor’s colt…. …..your father foolishly outbids his landlord and pays an extravagant price for a thoroughbred when your family really needs a strong plough horse. Granted, this portion was necessary for set-up; they only stress it in a million different ways but just in case you don’t get it, “Joey” the horse is special. He’s different, stronger and smarter than the average horse. Albie (…the racist dragon) trains him to come with a special owl call (like he read in a book about Injuns) and Joey somehow overcomes all obstacles to plow the stony field when surprise! Rain makes the earth more pliable. Other notables: Albie’s dad is an alcoholic with a gimp leg, both legacies of his time in the Boer War. Albie has a goofy-grinned best friend Andrew and a rival, David (son of their evil landlord), who is the “only boy in the village that can drive.” Unfortunately for this wunderkind, the girl he is trying to woo with his driving skills is much more impressed with Albie’s horsepower (literally) (har har). Due to a freak storm, the precious turnips are ruined and Albie’s dad goes to plan b: sell poor Joey to an army captain before he marches off to the front. DOWNTON PARALLEL: If you live in Devon (or a place that looks like Hobbiton) you get your war news via the town Paul Revere. If you are the Earl of Grantham, you can conveniently announce the news at your garden party, in front of your closest friends, relatives, and servants. 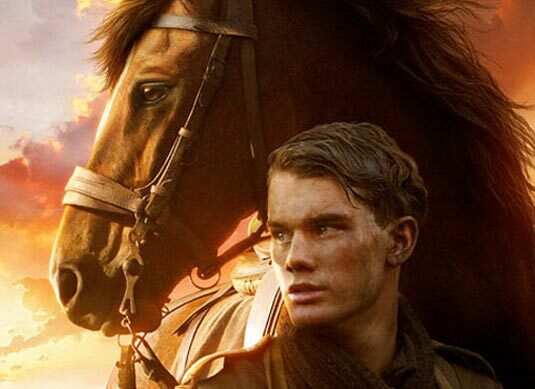 Luckily for Albie, his dad sells him to the kind blue eyes of Tom Hiddleston’s Captain Nicholls who promises to return Joey to Albie at the end of the war if possible (anvil clang). 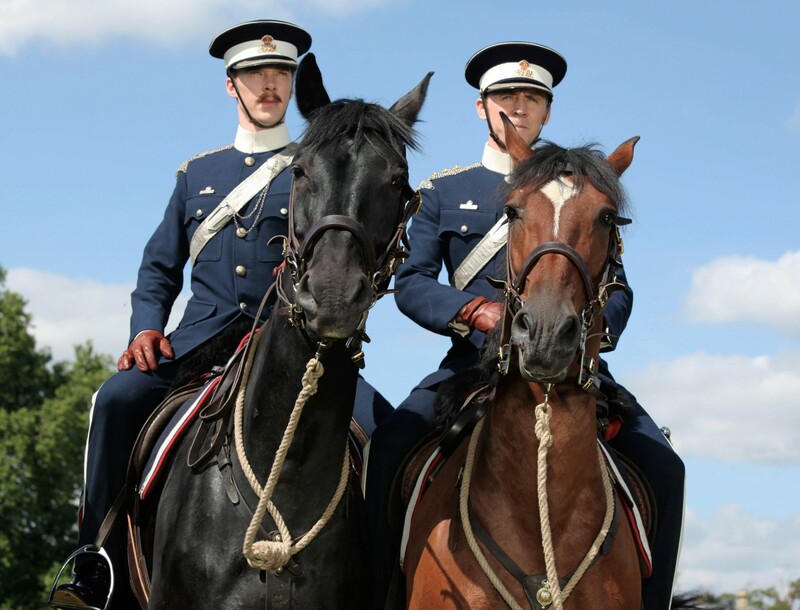 In memory of the precious few minutes we got of the Benedict/Tom bromance, Joey and Topthorn (BC’s horse) remain together in the German camp. And because Joey is special you guys, he shows Topthorn it is okay to be harnessed, ensuring both of their survivals. The appearance of the boy from The Reader as Gunther (David Kross) resulted in me listening to his speech patterns; I was trying to decide if he actually knows English now rather than just memorizing some consonant sounds. 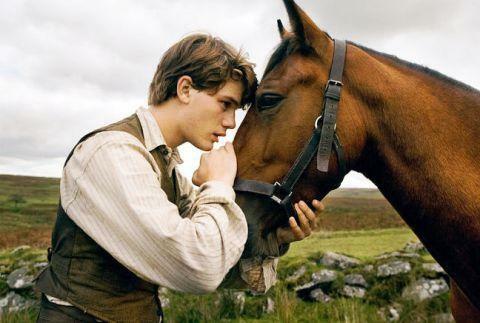 Lucky for him, he is really good with the horses; so much so that he gets to stay behind and care for them. His 14-year-old brother gets his orders to go to the front, and despite his protests, Gunther grabs him from the line of marching men and they flee to a nearby windmill (aka the most obvious hiding spot within a 20 mile radius). It is a gamble that in the end is not worth the risk: we all know what the punishment for desertion is….DOWNTON PARALLEL: One cannot help but think of poor Mrs. Patmore’s nephew MIA and later revealed to have been shot for cowardice. TORCHWOOD PARALLEL: Poor Tosh’s out of time semi-boyfriend Tommy, who was doomed to death once he returned to his appropriate timeline because of his PTSD (or shell shock) which, in the eyes of officers, was cowardice on the battlefield, and resulted in execution. This was probably my least favorite chapter in the story of Joey. I was truly enjoying the battlefield so to be torn away so abruptly into this farm setting was a little boring (especially if you are expecting an Inglourious Basterds type situation). A little girl, Emilie, living with her grand-père, falls in love with the two horses she magically finds in their windmill. All she wants to do is go riding, but she suffers from brittle bones.She wants to know about the death of her parents and he wants to talk about some pigeons. In the end, the horses are found when Emilie is allowed to ride Joey on her birthday and sent back into the field. Poor Joey and Topthorn are now employed with the wrenching work of moving heavy artillery up and down embankments. While we know this is something THE MIRACLE HORSE Joey is capable of, Topthorn is already struggling. MEANWHILE at the Battle of the Somme we see a familiar face: Albie! As one could have guessed, no able-bodied boy from Devon could escape conscription when his age allowed (but he was probably eagerly awaiting the day he could begin the Joey search, if Captain Nicholl’s sad little sketchbook and death notice did not dissuade him too much). Andrew is alongside Albie as well as Mr. I Can Drive David. The boys raid No Man’s Land, except Andrew is in charge of giving any cowards a bayonet to the stomach. Albie saves David halfway across the stretch of war-torn land (making me search my brain for what this reminded me of: The Pacific? Of course not…ahhh yes, the Doctor Who episode where the mean popular kid becomes friends with the little scrawny Love Actually boy when they are in the Great War–and his vision from the Doctor’s fob watch allows him to save them both on the battlefield). DOWNTON PARALLEL #1: In the second season, they sure do beat us over the head about how war changes everything, war is the great equalizer, etc: Matthew: “War has a way of distinguishing between the things that matter and the things that don’t.” And similarly, the fact that David got to drive around a pretty girl and their dad’s hate each other matter a lot less to Albie in the middle of combat. Andrew cannot bayonet his friends when they scramble back into the trenches and instead he leaps onto the field to join Albie. This made me wonder: would he have been accused of cowardice himself, for refusing to kill the cowards? Time wouldn’t tell because dear old goofy Andrew succumbed to mustard gas in the enemy trenches. DOWNTON PARALLEL #2: I did half expect to see Matthew and William preparing to go out on a raid. Oh Matthew, your eyes can shine through anything. BACK TO JOEY. Topthorn is completely spent; he lays down and will not get back up. With fighting breaking out, Joey is able to escape, only to leap around the trenches and get stuck in No Man’s Land, caught in barbed wire. This leads to one of my favorite scenes of the film: the cooperation between the British and German soldiers who cut Joey free. That both sides would break for Christmas celebrations or football matches and other such tales is one of the most heartwarming and heart-wrenching aspects of the Great War. The British soldier wins the right to take Joey back to his camp, thus setting up…. As storytelling allows, Joey and Albie end up in the same vicinity. TWIST! Their reunion is made all the more difficult by Albie’s temporary blindness due to the mustard gas. However, the fateful owl call he taught Joey as well as his perfect description of his features spare Joey yet again. There was only one obstacle left: Joey was going back to his beginnings—the farmer’s auction. While all the soldiers chip in to help Albie, the grandfather of the little girl appears and pays an astronomical price for Joey, recognizing that the miracle horse was being sold. He has his reasons for wanting him: his granddaughter is dead, and he wants the one piece of her that the war didn’t take. (And thus the whole little interlude in the middle of the movie wasn’t a complete departure from the plot). Albie mans up and says goodbye but Joey is reluctant; the old man pulls out Albie’s father’s regimental pennant from his pocket (that traveled from Albie to Joey to the old man) and he finally realizes the horse belongs with Albie. Albie returns home with Joey to his parents and I sit in wonder at how a movie can end so happily. The father isn’t even dead? Wow, and one of my friends thought for sure Joey would be heading to “The Glue Factory” by the end. Let’s just hope that Albie doesn’t end up like his father or poor Jimmy Darmody on Boardwalk Empire, forever haunted by his experiences. Just got done marathoning Enlightened this weekend. I really enjoyed the series so I am happy it is getting a second season. Great performances all around; I especially love Mike White’s portrayal of Tyler. Superficially, I am equally concerned about Laura Dern’s wardrobe. I want all of her clothes for work and there seem to be no blogs or sites dedicated to what she wears. I hope this changes soon: these outfits are SO CUTE. Amy is also a fan of pairing outfits with chunky belts. Emily PLEASE melt your cold, cold heart towards your only friend! Every episode of Revenge leaves me hungry for more Emily and Nolan interaction. He does so much for her and still she acts terrible towards him. She’s rude, they fight, they make up, she calls him her friend, they fight again but god forbid he touches her. Ugh! This is exactly how I used to feel about the Walt/Jesse relationship on Breaking Bad (I have absolutely given up on that one…Jesse needs to be far, far away from Walt). P.S. I don’t want to misrepresent the situation: Nolan tries to put his arm around her and she immediately shuts him down. This is the second Thursday in a row I have checked my schedule only to be reminded that 30 Rock is on at 8:00, not Community. It is a little jarring when you expect 30 Rock in the 9 o’clock hour. 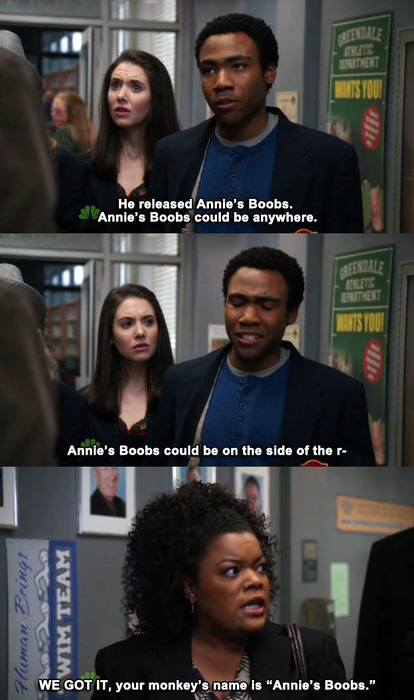 It is even more jarring when Community used to start Thursday nights off right. By that I mean Thursdays are a little inflated for me: I think I have had as many as 8 shows to choose from in the past–all between 8 and 10. Most shows are concentrated at 8 but Community was always my choice for live viewing. Because I still want to watch Parks and Recreation at 8:30, I begrudgingly watch 30 Rock at 8. 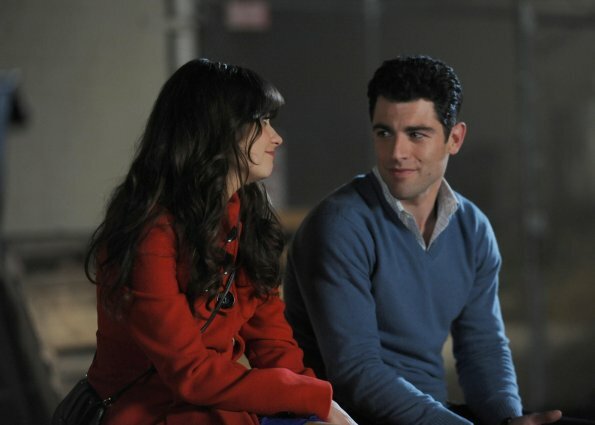 It is no secret that my love for New Girl roughly translates to my love of Max Greenfield’s portrayal of Schmidt. He regularly delivers an episode’s best lines. Last night’s “The Story of the 50” was Schmidt-centric, which means, I enjoyed it a lot. We were treated to a ton of great new insights about past and present Schmidt (and future Schmidt if he calls that number to pursue the game of male stripping while bringing in an annual $7K). He and Benjamin, a suitemate from college, have a weird, girl-style friendship where they kind of hate each other. His bronemy/fremesis. Nick: Last month he went to a party called “Bros Before Hos… on the Moon.” What does that even mean? And the dress code was Yacht Flair! Winston: He has a friend who legally changed his middle name to “Doin’it.” Just one word — Doinit. Nick: You are not emotionally, mentally, and spiritually prepared to throw these d-bags a party. PLL (Please Leave Lucas) Alone! It may seem that by simply choosing to be a viewer of Pretty Little Liars I should take my medicine when it comes to its faults. But the issue is that while it is definitely a guilty pleasure show, it was fairly decent. Storylines/characters showed promise and a girl could always admire the Liars’ wardrobe selections. But then PLL got too impressed with itself; it asked, how can I trip up the viewers and make as many suspects as possible for A? The strength of the show, for me, will always lie in the first 7-10 episodes. Those were the ones I marathoned when I discovered I actually enjoyed the show. The mysteries, and characters, were fresh. Since tuning into the second part of the second season, the show seems more dubious to me. And the show continues to expand its universe, probably in an effort to create a wider field for potential “A”’s in future plots. The past two episodes have made it blatantly obvious what the twist they are building toward will be (although not as blatant to some: fangirls on Twitter were very quick to cry out to everyone that Lucas was A). In the first episode back, Emily and Spencer are at an impasse, angrily arguing to the point where Hanna and Aria are also ostracizing Emily. At first I was confused: I couldn’t really remember what all went down in the mid-season finale, so I searched my brain for the cause of it. But as soon as A reached out to Emily I guessed the ploy: the Liars were playing A in order to trap him/her/it/them. That didn’t bother me much since it is a typical movie/tv trope. However, in last week’s episode, a similar “hoodwinking” occurred. I already feel the writers have screwed the Lucas character over in the past. (Not to mention I don’t like the Caleb character or his hair; there I said it. In fact, I thought his name was Tyler as I typed a draft of this post, that is how little I care about his presence). First Lucas became the geeky friend to the hot, popular girl Hanna who would never have a shot. When he is rejected, not only does he “de-friend” Hannah, he becomes one of the first red herrings for A when they show his muddied shoes after the destruction of the memorial to Allison. Then they remediated his character by having him go fetch…Caleb from wherever it was he went. End of story. (Except the guys are now roommates since Caleb is homeless in Rosewood). The past two episodes have displayed Lucas and Hannah as the best of friends again. I understand that him getting Caleb was a friendship-repairing act but us viewers did not get a taste of that until now (or an even gradual return to hanging out). Now, (rant time) it seems those feelings for Hanna never went away and he cannot juggle their friendship, his friendship with Caleb, and Hanna and Caleb’s omnipresent relationship. Never mind that he is the one that fetched Caleb back into all of our lives. So clearly Lucas has issues; I get it. It makes sense that he would need to call a crisis hotline to deal with his problem since it is so all-consuming. But can we please have an intervention when it comes to the Liars jumping to conclusions? I am trying to rationalize it by blaming it on enhanced paranoia, but seriously? If Ezra was calling the hotline, would they all (minus Aria) j’ accuse him as well? There was no suspense. I get that we as viewers have more insight into what Lucas is thinking but that knowledge combined with the Liars penchant for going on witch-hunts was just too much. But I never thought for a second that Lucas meant hurting Hanna in his cryptic calls. I mean, I do find it odd he may have been calling about either admitting his love or his inability to be friends but that leads me to my next point: this was straight-up character assassination. If he isn’t A, he was either painted as mentally unstable, suicidal, or just plain creepy to-serve-the-storyline. Having the Liars run around frantically screeching their heads off did not help the situation nor did its effect on Hanna’s demeanor. Meanwhile, Lucas is side-paddled into the lake. Not sure how this will be resolved vis-à-vis Lucas’ explanation for going MIA afterwards but at this point, I am not sure it matters to me. I really only care about these two at the moment. Please don't frak it up! UPDATE: The rant continues…instead of using the plausible storyline of Lucas being upset over the Hanna/Caleb of it all, no, too easy…Surprise! Lucas is into gambling? And gambled away Caleb’s “money.” Did viewers know of this secret stash of moolah? Obviously he makes bank by doing whatever he does with technology but did we know there was a physical stash? I could have used a bit of foreshadowing on this, I mean, this is a complete contrivance that also effectively assassinates the character via a different means: now he is a creepy, closet gambler. If the writers at all alluded to this reveal, they sucked at it. And finally, the nerve of Hanna and Caleb! Poor Lucas (or the person played by Brendon Robinson who used to be Lucas and is now a caricature of his former self). Lucas is basically attacked by Hanna and goes into hiding, attempting to regain some money that no one really knew existed. He then makes some of it back, only to have Caleb say, “It is a start.” Isn’t Caleb’s new found family loaded or something? Remember, Caleb, how you were frantically searching for Lucas over half of this episode? Hanna only offers up the phrase “You’re not who I thought you were.” So, he isn’t A? Or it turns out he is the type of person that takes financial risks? Or both? Does the show even know? I only write this in the hopes that PLL stops playing these games once they supposedly reveal A later in this season. Where the show goes from there, I have not a clue. But hopefully it will rely less on toying with the audience and more on staying true to the characters they have created. P.S. If I tried to write a similar rant about Glee, I think my head would explode.